My wife and I love Prong Horn Antelopes. 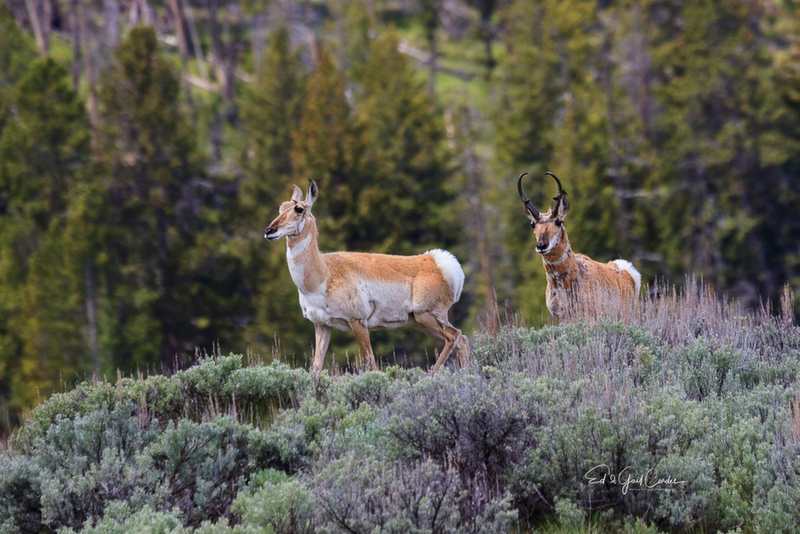 This image was shot in 2006 in Yellowstone NP with a 1D Mark 2 and 100-400 version 1. We were slightly off the trail and looking up at animals on a slight rise. They were totally comfortable with us. It was processed today using modern stuff. Nice one, Ed. It almost looks like they are perched/walking on top of a tree . I was there recently and I could also approach them pretty close. They are unafraid, maybe because they know they are the fastest in North America, what's to fear ? Glad you are sharing Ed. Lovely capture and love the use of habitat. Lovely perspective and setting for these two beauties, Ed! A good-looking Prong Horn couple, Ed. The nice habitat is a bonus.